I have been trying to find a less cumbersome name. 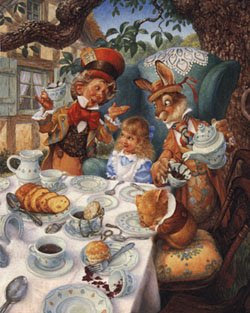 We are talking here of a counter intuitive world, where everything is the opposite of what it should be - surely this is the upside down world of 'Alice in Wonderland' - and the Mad Hatter's tea party? I'm thinking of calling it Mad Hatter Syndrome - the tendency to price a book without regard to condition , in fact in its extreme form to 'up' the price because of the poor condition. It is said there are some people, possibly entire nations, who are impressed by ex library books due to the idea that to have been in a library the book must be important. This is why people use words like 'retired from a library', as if the book had put in long and honourable service there, and even (though it's scarcely credible) some who regard poor condition as an indication that the book was much loved ('cherished' is the word). Talking of expensive prices our colleague and fellow book ranter Driffield (no copies known) had a theory that if a dealer's books were too expensive you should look closely at his or her stock because the high prices were a sign of ignorance and somewhere there would be a thumping bargain. A nice idea and occasionally it works but usually the overpricing covers all mistakes. If the dealer has got it bad, no one can afford to buy a book from them and they eventually go bust and end up selling ' 'The Big Issue' on the mean streets of London, accompanied by a dog on a rope and a can of K9. Later we turn up and buy his books from a creditor at 5% of marked price and sell them, not especially fast, at about 15% of marked price. At that point you can test Driffield's theory in detail. What actually happens is there is the occasional book (say 2% of the stock max) where you can actually get the price written in it. It's a mad world, my masters. hehe, rings a bell. nice picture too.